When I was stroking and squishing that maille merveilleuse that I bought from France, I really was thinking I needed to sew something for a baby with the leftovers. ...Then, of course, there is the Oliver + S Lullaby Layette pattern that was demanding to be sewn. .... and I had some nice merino jersey leftover which would do perfectly for lining a little jacket. But in my head, all of that sounded like a perfectly reasonable argument to sew something, so here is my only sewing gift for a kid this holiday season! I made the Size 6-12m jacket, but it turns out baby Hazel has just clocked over at 4 months old. So it should fit perfectly just about when the northern hemisphere summer rolls around. Oops. (face palm). Rachel kindly assures me they live in a land of air conditioners and a soft, squishy jacket will always get worn. Phew. Apart from the sizing gaff, I did get a bit inattentive while sewing and I ended up stitching the sleeve fronts to the sleeve backs and the body parts into two separate tubes. Unpicking the wool was fine, but the thick, fluffy cotton was a nightmare. There's nothing wrong with the instructions, it's actually quite a clever way of constructing the jacket, just be warned and pay attention! The lining is a little touch of down under in some fine merino jersey (probably from New Zealand as I recall it was a Fabric Store purchase). Now, between the taupe main fabric and the brown lining this was looking more like something I'd wear than a baby's jacket, and I went round and round in circles trying to decide on which bias binding colour would un-beige it best. It came down to the pink, a nice mustard and a peacock blue. They all looked great and I might have plumped for the mustard except that's really just a yellowy shade of brown, and Flipper interjected and said it had to be pink. And finally, for the lack of a label, I stitched her initials at the back neck. I like it better that way. Rachel and her family know who sewed it,... although they know who their baby is too, so that argument may not wash. It's not just that maille fabric that is warm and fuzzy. This was one of those times that I just felt good that I am able to make things, that I can share them here and for the friendships that I've made on the other side of the world. It's warm and fuzzies all round! And on that note, I hope you all have a happy holiday season and a glorious start to the new year! See you in 2015. Wonderfull gift! 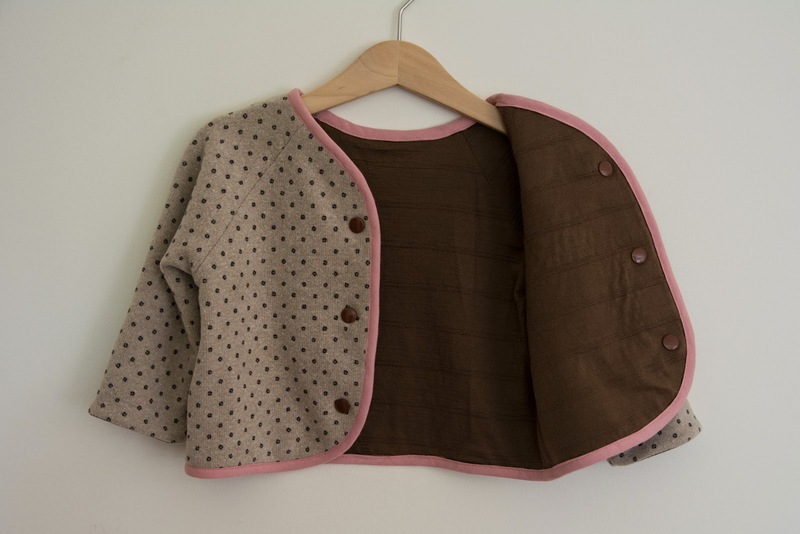 I love the little pink bias, Flipper was right this makes it a very lovely jacket. Thank you. I think he finds any request for an opinion to be an unwelcome intrusion, but I'll be happy to tell him you think he got it right! Merry Christmas. You're very welcome. I look forward to modelled pictures. I know you and Hazel will make it look much better than I did! It's adorable! I love the pink binding, that was a great call. Perfect for little Hazel. Merry Christmas to you all! I am forever looking for new ways to "tag" clothes and love the stitching! I often use fabric markers on the inside, but stitching is adorable.